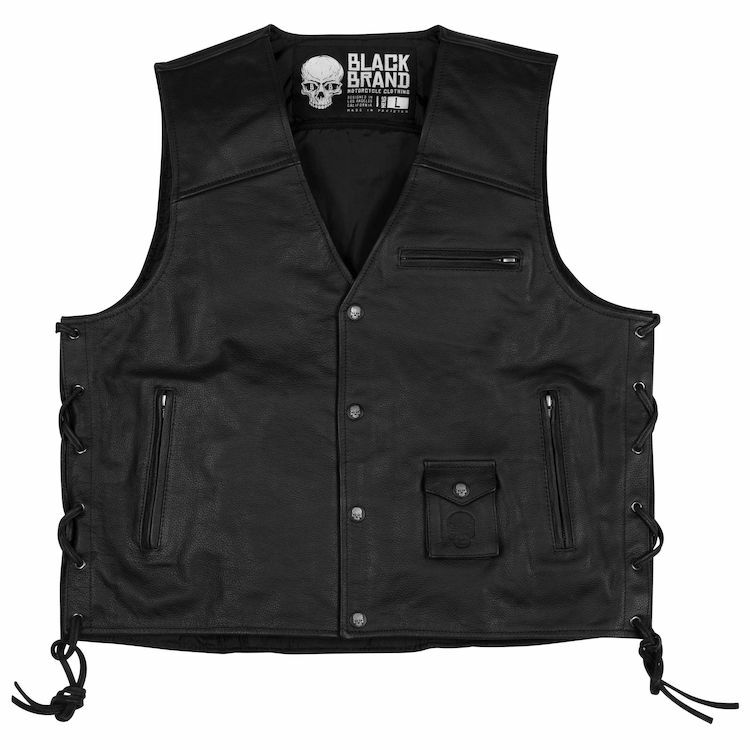 The Axe Vest has timeless style and all the features a classic motorcycle vest should have. Top-grain leather construction, YKK zippers, side laces for a perfect fit, zippered exterior pockets, inside pockets and a full zippered inner liner for attaching patches. Axe not included. Love it! The only thing is that the snaps on mine didn't hold. I took it to my leather guy and he put new snaps on the inside of the vest, Only cost me 5 bucks. Maybe I expected too much? I was slightly disappointed with this vest. The look is perfect - I mean if you want to look like an old biker, which is what I'm told I look like anyways. Buttons and zippers are of very nice quality, as is the leather. However, the leather is MUCH thinner than I had expected but it does not take away from the fit, form or function of this vest - I think I just expected it to be heavy leather. This vest appears to be very durable but offers little more than minor wind protection, but, in the event of a spill, you would still be very unhappy. This is perfect for a hot day - makes the ride to and from work tolerable in 85+ degree weather. Also, the pockets are big enough for cell phone, wallets and one or two other small items. The front pocket is very tiny - I don't think I can fit anything other than keys in here. I'm 6' 1" and about 215 lbs and the large fits me perfectly, and, because of the side lace adjustment, has plenty of room for a sweatshirt or light jacket underneath. Also, note that the front of this is VERY short - I believe the idea is that they don't want it to ride up or bulge out. Nice desin, in my opionion. Overall a very nice vest and I think my expectations were too high. If you know what you are getting, you'll be very happy. To be fair, I haven't used the vest just yet (Michigan weather). But compared to other vests, this seems to be made of high quality leather. I didn't know anything about this company (it's a newer company) but I really liked the vest and their website has a lot of great information. I will provide another review once I actually use this, but since the company is new and there were no reviews, I thought I would leave my first impressions. High quality leather, fit is great (I'm 5'11" and 220lbs - went with the XL), and I really like the look. Again - I can't speak to how long this will last (company has a great warranty) or if there's any issues when actually riding, but so far, it fits great, feels like it's made of quality leather, and I like it.